In life, there are only so many guarantees. 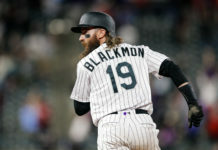 Death, taxes and for the Colorado Rockies in 2019, a quiet offense. Each game, the club has tried both new lineup configurations and emboldened strategies to overcome early-season injuries to key players. Against the San Francisco Giants, that blueprint once again faltered Saturday in a 5-2 loss. A trying early portion has given way to legitimate concerns about the future of the club’s attempt at a third consecutive postseason berth. Their run differential is now -36, the second-worst mark in the league, ahead of only the Miami Marlins. Ahead are takeaways from another losing effort for Bud Black’s battery. There are 30 teams in Major League Baseball, one of them being the Rockies. League-wide, they are also the only team that has yet to score a run in the first two innings in 2019. Their batting order in the first two innings, specifically their stars, has been silent. Through 15 games, the three have combined for more strikeouts than hits in the first two frames. Without production from their leaders, the Rockies have yet to garner any offensive momentum in the first pair of frames. 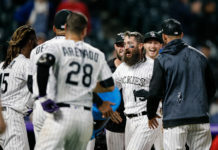 The troubles have lent themselves to subsequent innings as the Rockies remain one of the worst offenses in the National League. The loss of David Dahl has only complicated matters further, as the injured left fielder was 3-for-10 in the first two innings in his limited time before his abdominal ailment. In the era of flamethrowers, Kyle Freeland has made a living with control, commanding his fastball and offspeed offerings throughout the zone. When the control has escaped him, the lack of velocity has reared its head, a catalyst for his lack of success in his last two outings. After starting the year in dominant fashion, Freeland has allowed 10 earned runs off 16 hits since. To make matters worse, he left his latest start with a blister issue on his pitching hand. For a Rockies’ already-depleted roster, the hope is that he’s fine. The greatest lapse for Freeland came to Kevin Pillar on a first-pitch curveball that hung directly over the middle of the plate. A 103.5 mile per hour exit velocity and 405 feet projected distance were the result. The other key mistake, a run-scoring double by Buster Posey came on a slider that hung over the middle of the plate as well. Determining how much of the issue was due to the blister is a hard case to crack, nonetheless, the results were disheartening for the Rockies’ young southpaw. In 2014, Madison Bumgarner hurled 21 innings in a span of seven games to capture another World Series title for the Giants. Behind the plate, a fellow franchise mainstay in Posey. The pair were back to their old ways on Saturday, pairing to lead the Giants to a series-clinching win over the Rockies. Bumgarner tossed seven innings, allowed only two runs and struck out seven, while Posey went 2-for-4 at the plate, including his aforementioned third-inning double off Freeland. Much has been made about the demise of Bumgarner following a pair of injury-plagued campaigns. A velocity drop and lack of control have changed his arsenal greatly in recent years, lowering his strikeout totals. Despite his fall from a top-flight starter in the league, Bumgarner showed once again why he’s been so hard for the rebuilding franchise to deal away. The Rockies are far from the first team to garner loads of strikeouts in the latest season’s iteration of boom-or-bust baseball. Their problem is the boom hasn’t existed. Prior to facing the Giants in their 15th contest of the year, the Rockies averaged around 10 strikeouts per game. A 24-whiff performance in Friday’s 18-inning matchup further ballooned the per-game numbers. In their latest loss, they accrued 10. In their 12th loss in the last 13 games, the Rockies once again had a punchout problem. Exemplifying the club’s complications at the plate was the eighth frame. After a Chris Iannetta double to open the inning, ending Bumgarner’s day, the offense went stale. 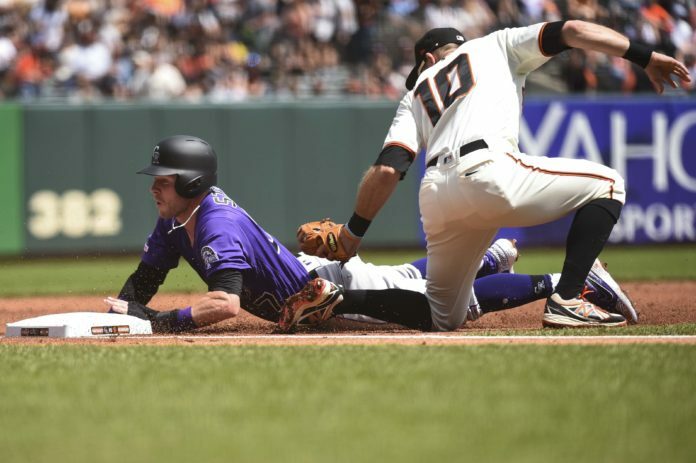 With a runner in scoring position, the Rockies struck out three consecutive times against Giants’ reliever Reyes Moronta. The stoppage from Moronta added on to his pair of strikeouts in his lone inning in Friday’s win. Stepping to the plate and going down on strikes is an unavoidable result in baseball. For the Rockies, the timing of the punchouts has been their kryptonite.